largest military base in the free world." Just how big is the Fort Hood Army post?? 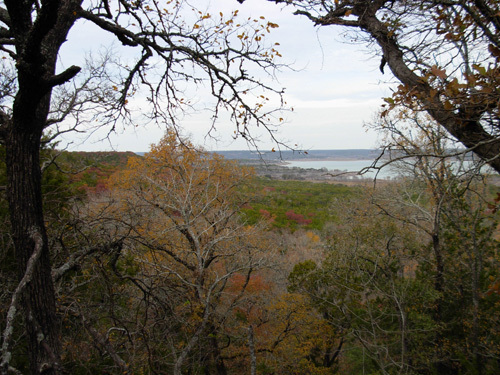 It covers 340 square miles (217,337 acres) in Bell County, TX, midway between Waco and Austin. If you look on a map, the colored area appears about as large as Houston (the city, not all the suburbs). It is the only post in the United States capable of stationing and training two Armored Divisions: the 1st Cavalry Division and 4th Infantry Division. There are an additional twelve units on post, including an army medical center and hospital, military police, air combat, and intelligence brigades. From 41,000 to 65,000 soldiers have been assigned to Fort Hood in recent years, approximately one out of every ten active duty soldiers (the numbers are always changing). Peak troop population at then-Camp Hood was 95,000 in 1943-4 during WWII. 70,000 family members live on post; others live off-post. A lot of those family members are children. There are six elementary schools and two middle schools on post (no high schools -- teens attend schools in Belton or Killeen). Over 12,000 civilian employees and contractors work on Fort Hood. Enough people live and work at Fort Hood to support two large PXs (Post Exchanges, like department/electronics stores) and two commissaries (grocery stores), both of which are tax-free; a gazillion banks (it seemed); several gas stations; numerous restaurants, snack bars, lounges, and food courts; nine fitness centers; ten swimming pools; lots of other sports and fitness programs and outdoor recreational activities; six child development centers and four youth centers; nine chapels; two museums; a library, theatre, and veterinary clinic; and many other organizations and services for troops and their families -- just like a small city! The installation has a huge financial impact on the local and state economy, to the tune of 10.9 billion-with-a-B dollars in 2007. So, yes, we found lots to do there. 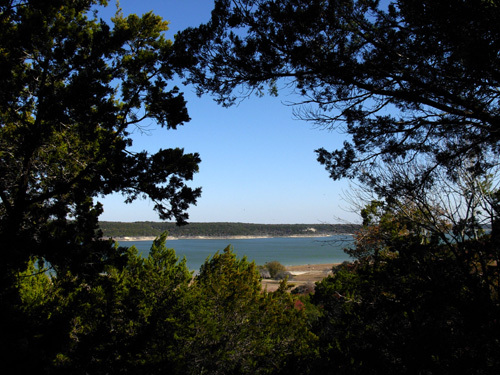 In the last entry, I wrote about spending the last eleven days camping at BLORA, the scenic Belton Lake Outdoor Recreation Area. This is one of only a few sections of the massive Fort Hood Army Post that is open to the public since the terrorist attacks on September 11, 2001. 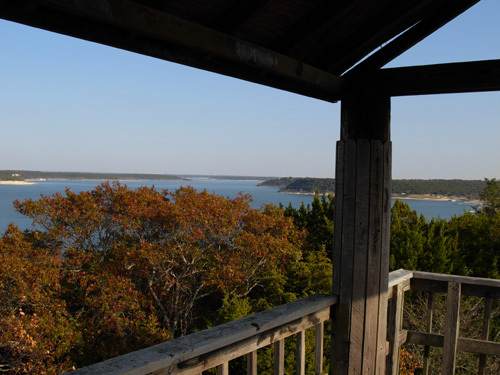 Visitors may enter the post for various special events, like a huge fireworks display on July 4, and to see the two museums, eat at Club Hood, and visit a few other places. When we checked into BLORA we asked about the nearest gate into the main post, which was to our southwest. Park staff quickly informed us that we would have to drive all the way around the post to the main gate and register at the Visitor Control Center, a 34-mile drive. Once we got there, however, the process was much faster than we expected. We had to show our drivers' licenses, military ID cards, vehicle registration and proof of insurance. We got a temporary vehicle pass good for the entire time we were at BLORA. Then we could enter any of the six or seven gates onto the main post. The nearest gate to our campground was about ten miles away. When we wanted to shop in Killeen on the south side of the post the shortest route was to drive through the post and not around it. I don't know the drill to get on post when a non-military ID holder wants to visit Club Hood, the museums, or various public events. I assume they have to go to the Visitor Control Center for a temporary pass. 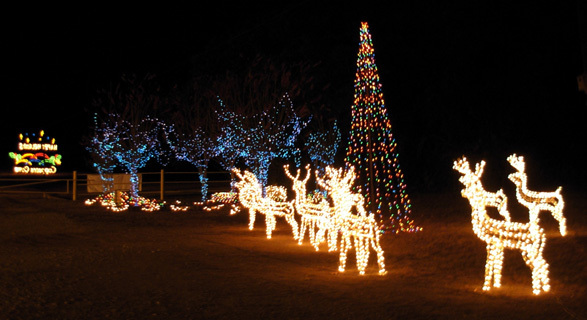 To use the recreational area or take the holiday lights tour at Belton Lake, visitors can just show up at the BLORA gate and pay the entrance fee. Remember those longhorn cattle I showed you in the November 20 entry? They graze the open range lands at Fort Hood. I learned how that came about when I was researching some history for this journal entry. When running or cycling on the mountain bike course, watch out for the cacti and cow pies. During World War II the Army needed lots of room for tank destroyer testing and training to combat the Germans. 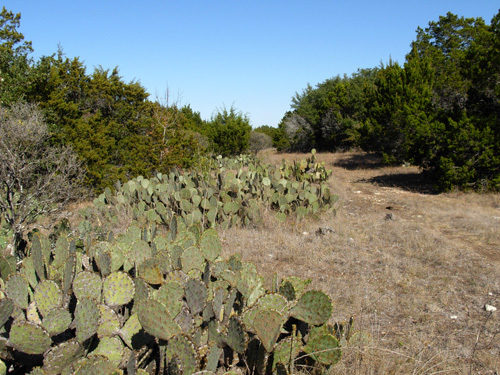 Central Texas was chosen as the site for a new garrison because of its abundance of space and rolling, semiarid terrain. It continues to be a good place for the Army's multifaceted training and testing of military units and individuals. 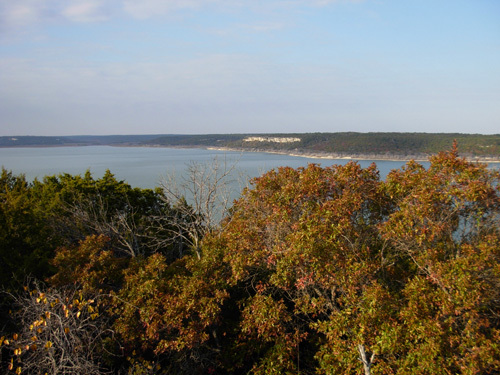 About half of the current land was initially acquired in 1941 and construction began on Camp Hood, named after Confederate General John Bell Hood. About 300 families had to move from their homes to make way for Camp Hood. The communities of Clear Creek, Elijah, and Antelope ceased to exist. According to Wikipedia, "To lessen the pain of moving, the Army agreed to allow land to be used for grazing for a nominal grazing fee. This grazing arrangement still continues today." Hence, all the cattle that roam the wide open range land where the soldiers test missiles and practice tactical maneuvers! We drove through ten miles of that land each time we went on post and had to be careful not to hit any cows. Unlike deer, cattle take their sweet time to cross the road -- or just stand in the middle of it. We also had to avoid a lot of cow patties on the bike trails. We never did figure out how they got past the fences and cattle guard to leave presents in the large field behind our campground at BLORA . 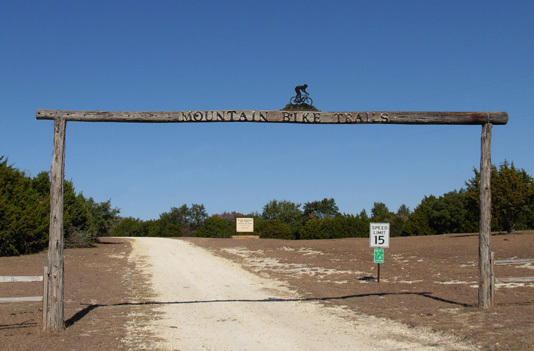 . .
Fort Hood played a major role in World War II -- and every subsequent war since, up to and including Afghanistan and Iraq. Troop population has fluctuated over the years, depending on world conditions. Its land mass has doubled. Besides its obvious peacekeeping mission, Fort Hood also plays major roles in national/international disaster relief and training/mobilizing the Reserve and National Guard to support Homeland Defense efforts. There is a lot of interesting historical information on the official Army web site (including this history page and this facts page), good ole mostly-reliable Wikipedia, and other sites you can search on your own. Every trip to a military installation with Jim increases my scant knowledge of how the armed services are organized and managed. I did not grow up in a military family, although my brother was in the Navy for four years. Jim's father was in the Navy but he was out by the time Jim was born so he didn't grow up in a military lifestyle, either. However, Jim was in the Army from 1967-1970 and served in Viet Nam for a year. Upon his return to the U.S. he was stationed at Fort Hood the last 16 months of his active duty and lived on post. After his discharge he served another 18 years in the National Guard. That's how he earned his status of "retired military member." I've enjoyed learning more about military life since marrying Jim. 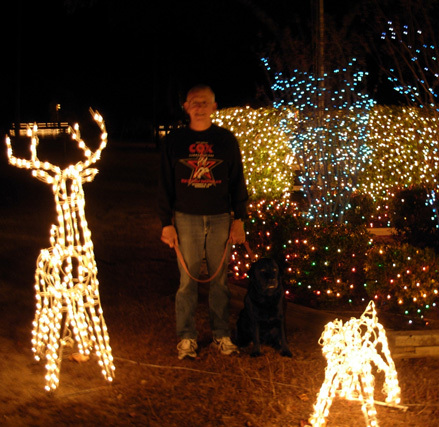 I've also enjoyed some of the perks that come with being a "retired military spouse," such as the FamCamps we've used and other facilities and activities on the posts and bases we've visited. 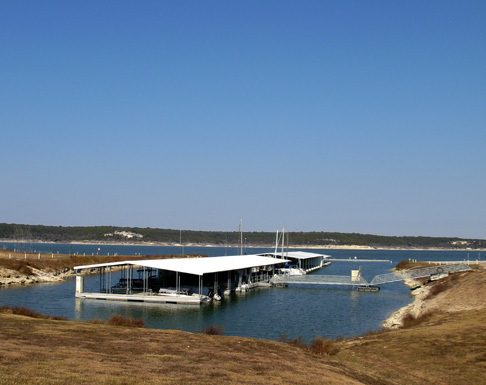 Because of its size, Fort Hood probably offers more to its active troops and retirees than any other military installation in the country. We found plenty to do on four or five trips onto the main post and left some things to do during future visits. Jim and Cody posed in one of the displays. Jim hasn't been to Fort Hood in thirty-eight years. He was curious if he'd recognize any of the buildings he used and the airfield where he trained. On our first day in the area we got our vehicle pass and drove around some of the main roads through the post. As you can imagine, a lot has changed in almost four decades. The post has experienced several growth spurts and efforts to modernize the buildings and improve housing. Jim didn't recognize much, even where he used to live. And the airfield was moved, too! While at the Visitor Control Center we picked up a monthly magazine called Hood Happenings and the weekly newspaper, The Sentinel. Both were very helpful resources during our visit. The magazine had a good map of the post, making navigation quite easy. 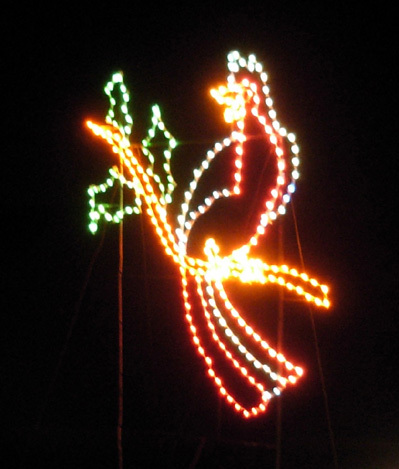 There were also articles about the Nature in Lights display at BLORA, special meals at Club Hood, and other activities. Most of our activities on post were pretty mundane, like using their laundromat several times (inexpensive, clean, never busy when we were there) and going to the two PXs and one of the commissaries. Sometimes we've found great deals on posts/bases, sometimes not. For example, we purchased most of our food the past week at Walmart and Sam's Club in Temple and Killeen because their prices are better than the Fort Hood commissaries. We tolerated the hordes at both PXs on Friday and Saturday after Thanksgiving, however, to get more than half off a Magellan GPS navigation unit for the truck, a new set of cookware for the camper, and a couple of 4G flash drives for our computers. It was worth the waits in line to save as much as we did and also avoid paying sales tax. (Sales tax around here is a whopping 8+ cents but food isn't taxed.) Other items like a portable propane grill and electric shaver were a better deal in town, however. Jim's been having fun programming "Maggie," our name for the female voice navigating us with the GPS unit. (Very clever, aren't we? 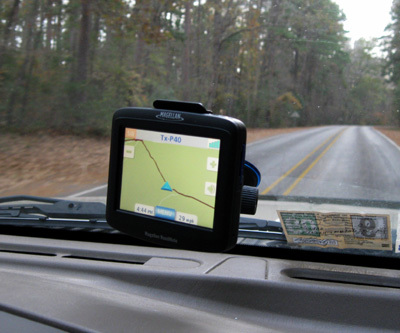 Probably six million other people call their Magellan GPS "Maggie!") Jim has borrowed several other brands and models of the trackers from friends so he could determine which one he wanted. This one was quite reasonably priced at 55% off retail and seems to have all the features we want. It also seems more accurate than his older hand-held Garmin unit. Ain't technology great? "Maggie" has already sent us down one dead-end street, however. Fortunately, we weren't pulling the camper at the time. The Army has a large department or "Directorate" called Morale, Welfare, and Recreation (MWR) that has its own website and publishes the Hood Happenings magazine to inform soldiers, their families, and retirees about all sorts of programs, activities, and events on post. 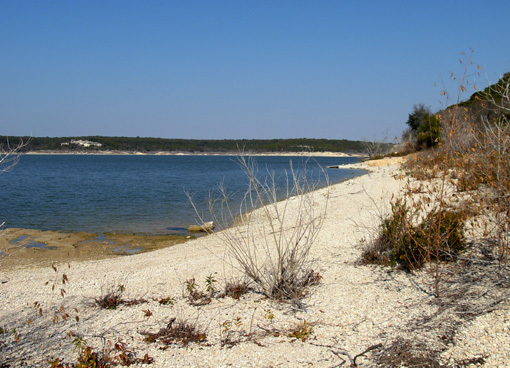 MWR runs the Belton Lake Outdoor Recreation Area, for example. The website has pages devoted to sports and recreation, dining and lounges, concerts and other events, and activities for children and youth. We quickly discovered that Club Hood, a nice dining and meeting facility on post, offers several special meals. There is a lunch buffet on weekdays, a fancy brunch on the first and third Sundays (unfortunately, we were there on the fourth Sunday), and a Tuesday night "Beef & Burgundy" buffet. We never got to any of the daily lunch buffets but we tried out the Beef & Burgundy buffet. Both the food and the value were good. We had shrimp and other appetizers, hot slices of beef carved to our order from a huge roast and served au jus, a baked potato, steamed vegetables, rolls, desert, beverages, and wine (that's where the "Burgundy" part comes from). We don't eat out very often so this was a nice treat for us. It was also interesting to see the mix of people who attended and what they wore, from blue jeans to evening clothes, BDUs to Dress Blues. We were somewhere in the middle on the formality scale (who takes fancy clothes camping?). 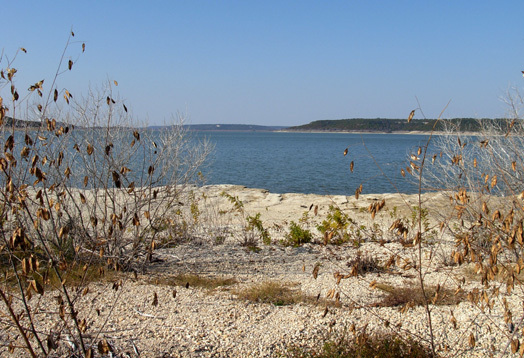 When we knew we'd be at Fort Hood for Thanksgiving we hoped we'd be able to find a nice place there or in one of the neighboring cities for a nice dinner. It's hard enough to cook a traditional Thanksgiving dinner for two when we're at home and have all the equipment and space we need to "do it right." It's another matter entirely to accomplish that feat in a tiny camper kitchen! We didn't even consider it. So we were real happy to read Hood Happenings our first day on post and discover we could make Thanksgiving dinner reservations at the "second seating" for their royal spread. We even got a nice discount for being 55+ . We arrived about 15 minutes before our 1:30 PM reservation and expected to be first in line. Ha! We couldn't believe the long line in front of us already. I bet they'd been there before. After the last folks from the first seating at 11:30 AM streamed out, our line began to move and soon we were being shown to a cloth-covered table with our name printed on a place card. We got a good look at the buffet lines on the way to our table -- appetizers, salads, entrees, deserts, beverages. It was quite a spread in an enormous dining room. We were happy to be seated in a corner of an adjacent dining room that was much cozier and had minimal foot traffic. The food was mostly excellent and another good value for the price -- not as cheap as dining in one of the mess halls but absolutely worth the money for the huge selection. We could have satisfied our appetites at the two salad/appetizer tables alone. There were six or seven kinds of expensive cheeses, salmon, pates, and other toppings for crackers, other appetizers, and quite a variety of fresh salad fixings. Entrees included slices of roasted turkey breast, Virginia baked ham, lemon-rosemary chicken, and tilapia. Traditional candied yams, mashed potatoes, dressing, gravy, wild rice, honey glazed carrots, green bean casserole, and cranberry sauce were offered, as well as less traditional (in our families, at least) roasted garlic red potatoes, corn on the cob, and macaroni and cheese (mac & cheese??). Various kinds of rolls, several beverages including rich egg nog, and a plethora of desserts rounded out the meal. Another distinguished-looking middle-aged gentleman in a suit was greeting folks he knew at a neighboring table. I figured he was probably a high-ranking officer. As he passed our table, he looked very hard at Jim, hesitated a bit, smiled and nodded, and wished us a happy Thanksgiving. We joked after he was out of earshot that he was probably wondering if Jim was a retired general or something! He appeared to be trying very hard to remember if he knew Jim and/or his rank. On future trips we'd like to visit one or both of the military museums, a couple of the fitness centers, maybe the theatre, and take in a concert if one is scheduled while we're there. It's always nice to save something for the next time. It's hard to believe that the first phase of our trip is already over. In the morning we'll be heading east to Huntsville State Park for a week. 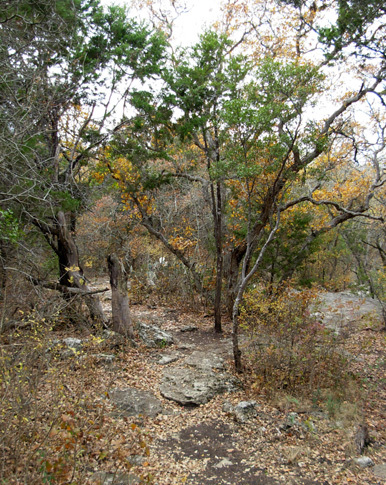 I'll have several entries about our training, the great running/hiking/cycling trails in the park, and the Sunmart race. Stay tuned!